Those of you who followed my earlier rantings at The Big Litowski, where this is being simulposted, already know that the first chapter and I have a bit of a history, particularly in reference to the first five pages, which agents and editors so often view as the key to a book's desirability. If the first five pages don't rocket you right into the story, the theory supposedly goes, no one's going to buy your book. Anyone read The Girl with the Dragon Tatoo? You may have heard of it. I read it. I liked it. But I'd say that book doesn't actually start going anywhere until about page 200. Of course, we all have different opinions of what it means to draw you into a book quickly. I've had plenty of readers, including a few agents, say TAINTED SOULS captured them from the get-go (even if, for one reason or another, the agents passed on the manuscript). On the other hand, I once re-wrote the first chapter (with an emphasis on the first several pages) at the specific request of one agent, who said the intro left her cold (she was left unmoved by the revision, too). One thing I think might be interesting is to write the first chapter last. By that time, you'll have a much better understanding of your characters, a more established voice and sense of the overall gestalt of what you're trying to accomplish. Though you should try to avoid too many of those $20 words. TAINTED SOULS is now available directly from the Barnes & Noble Nook store, here. For some reason, no cover image is available. According to Smashwords, this sometimes happens but B&N usually gets around to fixing it. Just one more stop on the bumpy road that is e-publishing. Another great review at Amazon, from "Michael," who says TAINTED SOULS "rates right up there with the best" of the mystery/thriller genre. Thanks! 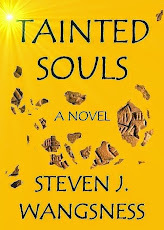 Another nice review, this time on Smashwords, where Pete Soares liked TAINTED SOULS' "well-paced and original plot." Sooner or later, I suppose, someone's going to pan it, but so far, so good! Thanks to "R.S." 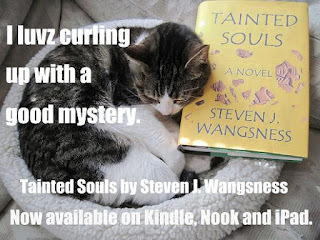 for sharing his opinion that TAINTED SOULS is a "many-layered mystery/thriller" that is a "great read." You can read the whole thing here.